The pelt handling contests are held to promote the educational and competitive aspects of preparing pelts for market under a friendly but competitive atmosphere. They are also intended to educate as well as entertain those who do not wish to enter but who want to futher expand and improve their own pelt handling techniques. 1. Contests will be open to any interested persons. Everyone is welcome to compete. In order to cover some of the costs for the awards, a minimal entrance fee of $3 per contest will be applied. 2. The competitors will be allowed to enter one fur pelt per specie. 3. For pelting contests inside the Fur Harvesters building, only one animal per contestant will be permitted (except for Kids Best Bundle Contest). 4. The deadline for the best handled pelts prepared at home is 10:00 am Saturday, April 12, 2014. The deadline for competitions where skinning is done in the building is 1:00 pm Saturday april 12, 2014. Pelts will be entered for the contest in the receiving room. They can also be sent to Fur Harvesters prior to the convention, but please specify clearly their intention for competition. 5. Contestants entering any pelt handling contest must register before the competitions. 6. Award winners will consist of 1st, 2nd and 3rd places. 7. The Ministry of Natural Resources award (the best handled bundle) will consist of 3 species of fur, except muskrat, red squirrel, ermine, skunk and opossum. Due to the prestige of the MNR trophy, combining best handled fur from other pelt handling competitions will not be permitted. Beaver, Raccoon & Otter (no time limit only for Otter). Teams will consits of two people: 1 licensed trapper & one person 16 or under. 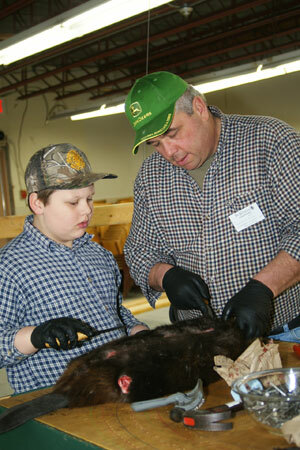 Fur to be prepared: 1 beaver and 1 raccoon. Entrants must jointly work together (no time limit). Skinning must be done by 1:00 pm on Saturday. Animals to skin will be supplied. If you do not have Acrobat Reader, please click the Adobe Acrobat Reader link and download the free plugin. Copyright © 2014 Fur Harvesters Auction Inc.